Please send information you would like included in CoffeeBreak via this form by 4:30 p.m. Friday, Nov. 11, for a Wednesday, Nov. 16, publication. I am writing to all of you to provide an important time-sensitive update on the Virginia Tuition Assistance Grant (TAG). TAG is a grant that is given to every one of our students who live in Virginia. For the 2016-2017 academic year, the estimated TAG undergraduate award is $3,200 (and graduate students in health professions are expected to receive $1,600). At Averett, 502 of our current students will receive a TAG award this year. It is critical that we convey to Virginia Governor Terry McAuliffe and members of the Virginia General Assembly how vital TAG funding is to our students, families, colleagues and communities and why TAG funding should be a priority for the Governor in the budget he introduces in December. Gov. McAuliffe will make final budget decisions at the end of November. I feel sure TAG is important to you, and would ask you to please send an email as quickly as possible to Gov. McAuliffe and members of the General Assembly to ask that they do everything possible to increase the award to $3,400. It is important that your voice is heard by the Governor and state legislators. For almost 45 years, TAG has helped make higher education more affordable for approximately 200,000 Virginians. Like many other programs, TAG was impacted by the economic downturn and funding was cut several years ago. Please urge the Governor and General Assembly to increase the TAG funding in the budget in order to increase the award amount. For many students at Virginia’s private colleges, the TAG award makes the difference between being able to afford college or not. Averett is a member of the Council of Independent Colleges in Virginia (CICV). CICV has a web page that will make it very easy for you to send an email or written letter to Gov. McAuliffe and your state legislators. The web page will also help you determine who represents you in the Virginia General Assembly. Please visit http://www.capwiz.com/naicu/va/home/. The TAG award is critical to Averett students. I urge you to please take a few moments to send an email to the Governor. Being a woman in the 21st century is certainly a high-risk profession. Navigating through this hazardous profession is not easy. In the past 40 years, we have seen a dramatic rise in female-related illnesses never seen before in history. Join Dr. Lynise Anderson on Wednesday, Nov. 16, at 10 a.m. or 2 p.m. in the multipurpose room as we explore the common thread in many female health complaints. Find out how estrogen dominance (ED) may be affecting your health and what you can do about it! Refreshments and door prizes will be available, so click here to register. The open enrollment period for health, vision, dental and flexible spending and health savings accounts has begun and ends at midnight Monday, Nov. 14, 2016. The open enrollment benefits portal is now available to all eligible faculty and staff, and the official 14-page open enrollment memo will be placed in the Benefitsolver.com Reference Center and the Averett intranet. Representatives from Anthem (medical) and UniCare UniView (vision), LD&B (flexible spending account/FSA), Health Savings Administrators (HSA), AFLAC, Bankers Insurance, California Casualty and Colonial Life will be available for the Enrollment Benefits Fair today, Nov. 9, and Thursday, Nov. 10, from 9 a.m.-5 p.m. in the multipurpose room. They each will be stationed at a table for you to come anytime during the fair hours to ask questions pertaining to plan options and respective coverage. The CCECC is partnering with the Boys & Girls Club of the Danville Area to host the Angel Tree Celebration on Wednesday, Nov. 30, at 5 p.m. If you would like to sponsor an Angel this year, stop by the CCECC today, Nov. 9, to choose your Angel’s wishlist! Click here to see the guidelines for purchasing gifts. All gifts must be wrapped and returned to the CCECC before Thanksgiving break. If you have any questions, please contact Cierra Gunter at ccgunter@averet.edu. Averett University will host an estate planning information session with keynote speaker, Robert B. Lambeth, Jr., president of Virginia Private Colleges, on Thursday, Nov. 10, from 4-5:30 p.m., at the Violet T. Frith Fine Arts Center. Attendees will learn how to make the most of investments and maximize wealth and security during retirement. Lambeth has served as president of Virginia Private Colleges since 1983, where he oversees the coordination of collaborative projects for its member institutions, including government relations, marketing and business and purchasing activities. He received his bachelor’s degree in political science from Randolph-Macon College in Ashland, Va. and studied at Wroxton College in Banbury, England. He earned a law degree from the T. C. Williams School of Law at the University of Richmond and has also done graduate work in government and foreign affairs at the University of Virginia. While the Cougars face off against Huntingdon College at 1 p.m. Saturday, join us at half time or immediately following the game in the Frank R. Campbell Stadium for a meet-and-greet with Bowman. 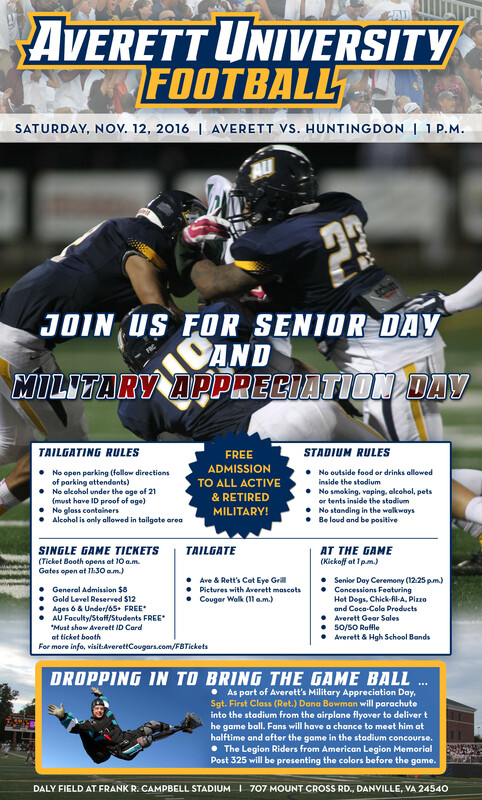 All faculty, staff and students get in free with and Averett ID card, and for this game, all active and retired military will receive free general admission. For more information on tickets and tailgating, click here for the full flyer. Then, on Sunday, Nov. 13, all are invited to hear his address to the Averett University community at 6 p.m. in the Violet T. Frith Fine Arts Center. On Tuesday, Nov. 15, the Averett Women’s Network will host Christine Baggerly, vice president at First Piedmont Corporation, as she returns to Averett to discuss the ins and outs of professional negotiation. Join us at 4:30 p.m. in the multipurpose room for an interactive session on why negotiation is so important, and how you can be your best advocate. Contact Alexis Ehrhardt at (434) 791-7212 or aehrhardt@averett.edu with any questions. Karen Shields from Sam’s Club will be on campus Wednesday, Nov. 16, and Thursday, Nov. 17. She will be in the dining hall from 10 a.m. to 1 p.m. to enroll new members and renew current memberships. Memberships can be renewed up to five months in advance. Your Human Resources and Payroll teams have created several new pages on the Averett University website. Please visit and take a look at some of the resources available here. Information about benefits, the new timesheet (effective November 11), the biweekly payroll schedule, and more is now available 24/7 online. New resources will be added over the coming weeks that address what it means to be exempt or nonexempt, what is work time, and other topics related to timekeeping and payroll. In the meantime, please join us for an information session to learn the how and why of the changes relating to overtime and timekeeping that become effective December 1. The new timesheet and deduction schedule will be presented, so bring your questions on Thursday, Nov. 17, at 2:30 p.m. in the multipurpose room. You can also submit questions to HRPayFLSA@averett.edu. The Office of Student Engagement and Leadership Development is working to hire their 2017 New Student Orientation Staff. If you have any students that you think would be energetic, fun, and ready to meet our incoming class, email their names and email addresses to averettorientation@gmail.com or tell them to come by our office on the fourth floor of the Student Center for an application packet. Applications are due by Tuesday, Nov. 22. There will be SAAC members at the staff meeting on Thursday, Nov. 17, to collect any non-perishable food items or money you would like to donate to the cause, as well as boxes placed on the third and fourth floors of Frith and at North Campus for can donations. If you have questions or would like another way to donate to the cause, contact Sam Chandler at schandler@aumail.averett.edu. Thank you so much for all of your support! It’s fundraising time for Alpha Sigma Phi at Averett University and this holiday season we are doing something really special. Yankee Candle has agreed to give us a portion of all sales through this link so that we can help fund the travel of our brothers to Saint Louis this winter for Better The Man Weekend. This is a big deal and a great opportunity for our brothers to start networking with other leaders in the fraternity from all over the country. Thank you for your support in Averett’s national fraternity, Alpha Sigma Phi. Averett is approaching its reaffirmation with the Southern Association of Colleges and Schools Commission on Colleges (SACSCOC), the regional body for the accreditation of degree-granting higher education institutions in the Southern states. The site visit from the SACSCOC review team will be February 20-23, 2017. While the team is on campus, we will need all hands on deck to make sure things are running smoothly. This is an incredibly important visit, and essential to Averett’s operations and continued success for our students. You will be learning more soon, but please mark your calendars and do not plan to be off during this time.